Ground pork is an under appreciated meat. I only just recently started cooking with it myself. It makes great maid-rite type sandwiches. It’s real tasty in place of ground beef in all kinds of Italian dishes. And I like to brown it with some seasoned salt as a pizza topping. I’ve been wanting to experiment with seasoning plain ground pork for various types of sausage. Tonight was the night. I tried an Italian sausage recipe, and a breakfast sausage recipe, and used them to top a couple of homemade pizzas. But I’m not there yet, so I’ll share with you my starting recipes. The great thing about making your own sausage is that you can omit unwanted ingredients such as msg or other things you might be allergic to, you can control the salt content, and you can make it as spicy or as mild as you like! Each of these seasoning recipes is enough to season one pound of ground pork. To save time you could multiply the recipe, store it in a ziplock bag, and then just take out the amount you need each time. I put the ground pork in a bowl, and mixed the seasoning ingredients in a separate bowl. If you want you can run your seasonings through a spice grinder or coffee grinder. I prefer the au naturale quality of having bits of seeds and flakes of parsley visible in the final product. And also I had a 6-year-old boy whiiiining about how staaaaaarving he was. So I took all shortcuts possible. Sprinkle the seasonings over the meat and get ready to get your hands messy! Squeeze and mix the seasoning all through the ground pork with your hands. For optimum flavor you can then let it set in the refrigerator overnight so that the flavors really meld into the meat. I’m not that much of a planner-aheader, (and there was the aforementioned 6-year-old boy), so once I had it all mixed in good I immediately browned the meat. You could also shape the seasoned pork into patties and fry them. If you’re interested in a half or whole hog, just email themillers92 (at) osage (dot) net. Last spring butchering date is Monday April 28! Combine spices. Run through a grinder, if desired. Mix well into 1 pound ground pork. Refrigerate up to 8 hours, if desired. 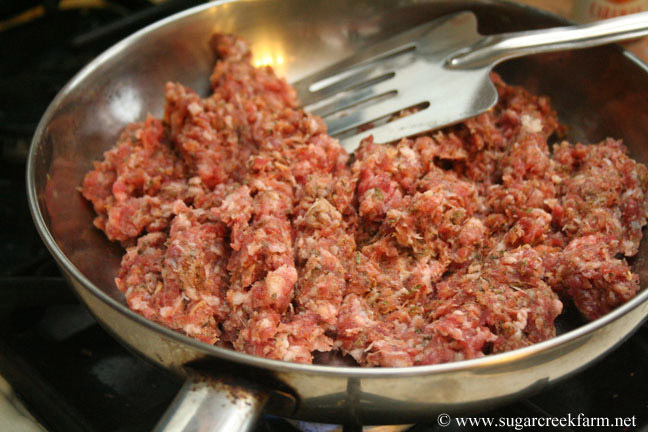 Brown meat, or shape into sausage patties and fry. Notes: As I mentioned, I didn’t have anise or fennel seeds, so I substitued caraway seeds. Also I thought 2 t. salt made the final product too salty, so next time I will only use 1 t.
Follow directions given for Italian Sausage above. Notes: I only had ground sage, so I substituted 1/4 t. for the dried sage. I didn’t have any marjoram, so I substituted 1/8 t. ground thyme there. MMM. I do the same thing. I also put an asian slant on it by adding grated ginger, soysauce, and sesame oil and garlic, fry it up good and grind it in the grinder..then I put it into wonton sheets, fold them over, put them on a greased cookie sheet, spray the wontons with baking spray, bake them at 350 till the wontons puff and turn brown. Since the pork is already cooked you dont have to worry about it. You can dip in teriyaki or soy, or just eat plain..my kids love them, and theyre such an easy appetizer if youre having company. We use fresh ground pork all the time. We like to use a 1/2 or 1 to 1 ratio with premium ground beef and we make meatballs. Some we added italian spices to and grated romano and parmesean cheese to, and use them for spagetti. The others we season mildly and keep pre-cooked in the freezer so we can quickly zap upa batch of homemade coctail meatballs! Yummy!! Both of these recipes are delicious! I had ground pork from a hog that I just didn’t know what to do with. Now I do. THANK YOU for this wonderful, simple, human-sized recipe. I live in Iceland where there are no good fresh italian sausages so I’ve resorted to making my own. So many of the recipes I found online were for large-scale sausage production, but this recipe with fresh onion, garlic, and parsley instead of the dried was just what I was looking for. I’m definitely going to do it again. Thank you! If you want to make Italian sausage using ground pork, try DiFiore Seasoning. Its available on the web at http://www.difioreseasoning.com. It is premixed sausage seasoning. Use 2and 1/2 level teaspoons per pound of pork (or any meat). Add 1/2 teaspoon per pound of salt (optional) and it makes great Italian sausage. So glad to have found these recipes. Of course, I'm going to experiment with the yumminess in my spice cabinet, but I'm so excited to see that it has been done 🙂 Off I go into the fray!